Here's another project that can be made free by anyone who orders the Love You Much Bundle from me. 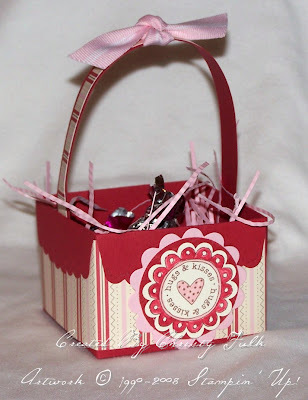 I made the basket with 4 scallop envelopes made with my Stampin' Up! exclusive Scallop Envelopes Bigz die. I also made the filling in the basket. I crimped a piece of Pink Pirouette cardstock and cut it into very thin strips with my Tabletop Paper Cutter. This cutter is great at making super thin strips. I'm really having a lot of fun with this bundle! Two of the other projects are my "Love Card" and my "Top Note Card". To find out more about the bundle and my special with it, click "Top Note Card" above. I'm hoping to get the last of the 4 projects posted tomorrow.